Rediscover the Christmas story. These tales look at the real Christmas story by those who saw it. 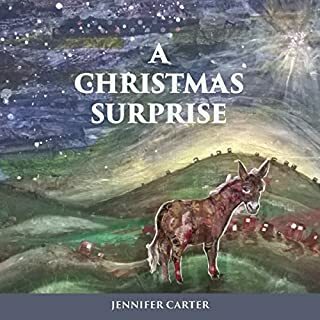 Four short stories look at the story of the birth of baby Jesus as seen by the donkey in the stable, the shepherds on a hillside, the star gazing down on the little town of Bethlehem, and the baby's mother, Mary. Based loosely on the Bible story about the arrival of the baby Jesus, these tales take a refreshing look at the nativity story at the heart of Christmas. What did you love best about A Christmas Surprise: A Read-Aloud Bedtime Nativity Story for Children? A simply written and heartfelt rendering of the Christmas story told from multiple perspectives. The narrator did an excellent job of drawing me into the individual stories. I loved the perspective of the donkey and his expressive voice. This is a perfect bedtime story.